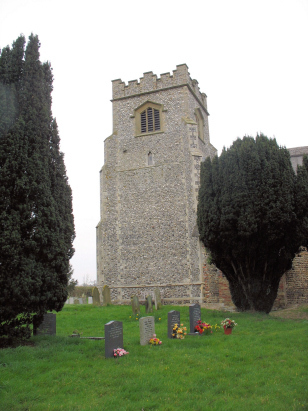 The parish of Burlingham St Edmund (also known as South Burlingham) is one of a trio of Burlinghams grouped in eastern Norfolk on either side of the A47 between Norwich and Great Yarmouth. St Edmunds lies to the south of the busy road and consists merely of a straggle of farms and houses to the east of the modern village of Lingwood. St Edmund's church sits on a narrow lane in open country; it shows some features which indicate an early age for Norfolk with Norman doorways. 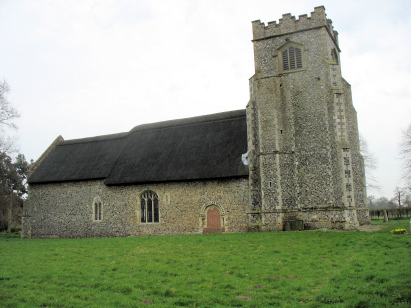 The rest of the church is probably late 12th to early 13th century, again early for Norfolk churches. The main body of the church has a fine thatch cover - a tribute to the proximity of the River Yare and its associated reed beds. This small transcript was extracted from Microfilm MFRO/686 in the collection of the Norfolk Record Office. This is a very recent filming and the image quality and contrast was very good. The register itself was subject to fading in places but in the main this was a relatively straight-forward transcription. It is to be hoped few errors have been introduced through the gremlins.